PHOTO: Allen Ramsey, DWCPhoto.com. Highlands junior wide receiver Nick Veneman (middle) makes a tough catch in the first half against Simon Kenton. Veneman had four catches for 141 yards and three touchdowns in the loss to the Pioneers. PHOTO: G. Michael Graham. Highlands Homecoming King Noah Moore (left) and Queen Hannah Harris (right). It's not the type of history anyone wants to be a part of. But after scoring in the 70s against opponents four times in 2013 and three times in 2011, a team did it to the Highlands Bluebirds football team Friday tying a Highlands school record. The Simon Kenton Pioneers became just the third team in the proud history of the Bluebirds to score in the 70s against them in a 77-53 victory on Homecoming. 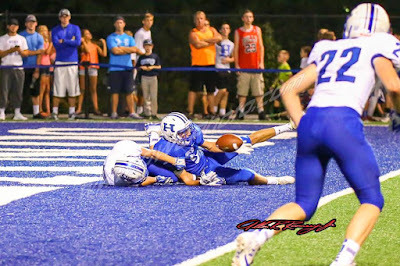 Simon Kenton tied Covington Holmes for the most points ever scored against Highlands as a result. The only two other times teams did that to Highlands came all the way back in 1920 when Holmes beat Highlands, 77-0 and the next year when Cincinnati East Side (Withrow) shut out Highlands, 74-0. Back in 2013, Warren Central came the closest to scoring 70 on Highlands in recent years scoring falling a point short in a 71-69 victory. On the other side, Highlands has scored 80 or more points in a game four times in a school history. All four came before the Kentucky High School Athletic Association implemented the running clock rule in 2001. The 1998 undefeated Class 3A state championship team broke the school record with an 88-12 victory over Campbell County. The most lopsided win in Highlands history came in 1927 in an 86-0 win over Batavia (Ohio). The Bluebirds recorded 80-0 victories in consecutive seasons in 1968 against Holmes and 1969 against Newport. The 77-point outburst came nowhere near the state and Northern Kentucky records. Dixie Heights hung 100 on Newport in 1969 for the Northern Kentucky record and Male tagged 149 on Tharp back in 1913 for the Commonwealth of Kentucky record. The second straight 1-5 start is the fourth such start in school history. The same 1927 squad opened the season with that 86-0 win over Batavia before losing five in a row then winning two of its last three games. The 1939 Highlands squad holds the school record for the most consecutive losses with eight in a row. That team finished 2-8 beating Carrollton, 24-0 to open the season and finishing it with a 33-0 win over Dixie Heights. For as tough as last year went, the Bluebirds bounced back from the rough start to go 8-6 earning district and region championships before losing 41-31 to Pulaski County in the state semifinals. That 2015 team recorded the 60th straight winning season in school history dating back to a 4-5-1 campaign in 1955. The Bluebirds own 91 winning seasons in 101-plus seasons. Highlands seniors Noah Moore and Hannah Harris took the Homecoming King and Queen honors respectively. Moore is the Highlands Class of 2017 President, the Spanish Club President and is the captain of the Speech Team. He's also on the Student Leadership Panel. "It's really an amazing experience because I'm surrounded by so many awesome people at this school," Moore said. "I feel really lucky to have such a supportive environment around me. I couldn't be happier to represent that through this." Harris is a senior outside hitter for the 10-10 Highlands Ladybirds volleyball team. She's also involved with FCCLA (Family Career and Community Leaders of America) and is a Freshman Mentor. She also had friends on the Homecoming Court. "It's an honor to be the (Homecoming) Queen at Highlands," Harris said. "We (friends) were all excited no matter who won. It's definitely exciting to anyone to get (it). I'll remember it for sure." Harris is one of six seniors on the volleyball team headed by third-year Head Coach Katelyn Sallee. Highlands is looking for its first district championship since 2012. The Ladybirds last made the state tournament in 2004. "It's definitely been up and down, but we have six seniors and a lot of our starters are underclassmen. We started off a little unsteady but we're getting there now," Harris said. "We have a really good-looking season ahead of us even though we're halfway through. (Coach Sallee) wants to win and it puts a lot of pressure on us. It's good to know we're being looked up to and we have to set a good example for the younger volleyball players." Highlands starts district action in two weeks at Dixie Heights (3-2) on Oct. 7. The Colonels have already won as many games as last year with a 23-12 win at Boone County on Friday. Covington Catholic (4-2) saw its four-game winning streak snapped with a 49-17 loss to St. Francis De Sales from Columbus (Ohio). CovCath travels to Grant County on Oct. 7. Grant County finds itself 3-3 overall following a 41-13 loss to Louisville Holy Cross on Friday. First-year Head Coach Jamey Dalzell guides the Braves.